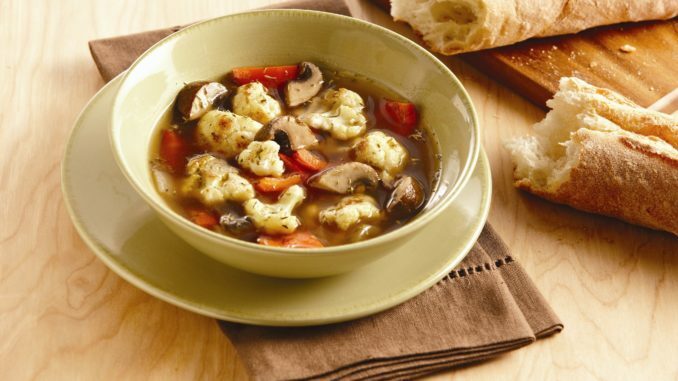 Toss cauliflower, mushrooms and bell pepper with 2 tablespoons oil. Sprinkle with thyme and cumin. Toss until evenly coated. Roast in preheated 450F oven 15 to 20 minutes or until cauliflower is golden brown, stirring occasionally. Meanwhile, heat remaining 2 teaspoons oil in large saucepan on medium-high heat. Add onions; cook and stir 5 minutes or until softened. Add vegetable mixture, broth and pepper. Bring to boil. Reduce heat to low; simmer 10 minutes or until cauliflower is tender, stirring occasionally. Ladle into soup bowls to serve.